"The DB" redirects here. For other uses, see DB. The Amazing Spider-Man #555 (2008). The Daily Bugle (at one time The DB) is a New York City tabloid newspaper appearing in American comic books published by Marvel Comics. The Daily Bugle is a regular fixture in the Marvel Universe, most prominently in Spider-Man comic titles and their derivative media. The newspaper first appeared in Fantastic Four #2 (January 1962), and its offices in The Amazing Spider-Man #1 (March 1963). The Daily Bugle was first featured on film in the 2002 film Spider-Man. The fictional newspaper is meant to be a pastiche of both the New York Daily News and the New York Post, two popular real-life New York City tabloids. The Daily Bugle was founded in 1898 and has been published daily ever since. The Daily Bugle is printed in tabloid format like its rival The Daily Globe. The editor and publisher of the Bugle, J. Jonah Jameson, began his journalistic career as a reporter for the Bugle while still in high school. Jameson purchased the then-floundering Bugle with inheritance funds, from his recently deceased father-in-law and turned the paper into a popular success. Other magazines published from time-to-time include the revived Now magazine and the now-defunct Woman magazine, edited by Carol Danvers. The newspaper is noted for its anti-superhero slant, especially concerning Spider-Man, whom the paper constantly smears as a part of its editorial policy. However, the Editor-in-Chief, "Robbie" Robertson, the only subordinate to Jameson who is not intimidated by him, has worked to moderate it. More positively, the newspaper has also published important exposes of political corruption and organized crime in the city, and also takes a strong stance in favor of mutant rights, which has led to its being targeted by various criminals and hate groups. Due to declining circulation, Jameson has conceded to Robertson's objections and has created a special feature section of the paper called The Pulse, which focuses on superheroes. In addition, the paper also intermittently ran a glossy magazine called Now Magazine. Soon after the team's formation, the New Avengers decided to strike a deal with Jameson regarding exclusive content in exchange for removing the strong anti-Spider-Man sentiment from the newspaper, to which Jameson agreed. Merely one day later, Jameson broke the spirit (though not the letter) of his agreement with Iron Man, using the headline "a wanted murderer (Wolverine), an alleged ex-member of a terrorist organization (Spider-Woman) and a convicted heroin-dealer (Luke Cage) are just some of the new recruits set to bury the once good name of the Avengers," but refraining from attacking Spider-Man. This prompted Jessica Jones to sell the first pictures of her newborn baby to one of the Bugle's competitors instead. In the first issue of Runaways vol. 2, Victor Mancha states in an exchange about Spider-Man that "The only people who think he's a criminal are Fox News and the Daily Bugle. And the Bugle is, like, the least respected newspaper in New York City." The paper's major named competitors are the Daily Globe, which implicitly takes a more balanced look at the superhero, Front Line, run by EIC Ben Urich and Sally Floyd, and The Alternative. After Peter Parker revealed he is Spider-Man and the Bugle planned to sue him for fraud, the paper itself was put on the defensive with front page accusations from The Globe (with information secretly supplied by Bugle reporter Betty Brant) of libeling the superhero. The adventures of the staff of the newspaper beyond Peter Parker have been depicted in two series, Daily Bugle and The Pulse. After Jameson suffered a near-fatal heart attack, his wife sold the Bugle to rival newspaper man Dexter Bennett, who changed the name to The DB (either standing for Dexter Bennett or Daily Bugle), and transformed it into a scandal sheet. Since after Brand New Day no one knows the secret identity of Spider-Man anymore, the animosity between Jameson and Parker is retconned as a simple financial question, with Jameson's heart attack coming right after a monetary request from Peter. The reputation of the DB since the mention in Runaways has plummeted down because of the new, scandalistic angle Bennett gives it. Several reporters unwilling, or refusing the new course, like Peter himself, are forced to go away, finding a new safe haven in the Front Line, the only magazine willing to accept people fired by Bennett, pursuing a scorched earth policy over them. The villain Electro targeted Dexter Bennett because of a government bailout plan for the financially strapped paper. 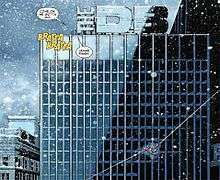 Spider-Man intervened, and during a battle inside the DB offices, the entire building was demolished, bringing an end to the newspaper as well. Front Line was a newspaper founded and run by Ben Urich and Sally Floyd. The organization was formed in Civil War: Front Line #11 as Frontlines.com. The newspaper appeared in the miniseries World War Hulk: Front Line and Siege: Embedded. Originally it was not competitive with the Daily Bugle while Jameson was still in charge, but it became an alternative view to The DB once Bennett took control. Sometime after the DB's destruction, Jameson, now the mayor of New York cashed in the DB shares he acquired from Bennett and gave the money to Robbie Robertson. Jameson asked Robertson to remake Front Line (which itself was on hard times) into the new Daily Bugle. Ron Barney (Reporter) - Named but yet to be seen. Joe Bazooka (Reporter) - Named but yet to be seen. Mike Berino Bering (Reporter) - Never seen, only named. Miriam Birchwood (Gossip Columnist) - Attended Reed and Sue Richards' wedding. Phil Bostwich (Reporter) - Never seen, only named. Ed Brubaker (reporter) - based on actual person, co-wrote report of Captain America's assassination with Kat Farrell. Ken Ellis (Reporter) - dubbed the Scarlet Spider... the Scarlet Spider. Tim Gluohy (Reporter) - Named but yet to be seen. Samuel Kingston (syndicated columns editor) - offered Phantom Reporter a job because of his "unique" perspective. Joy Mercado (Reporter) - A tough, intelligent, sassy investigative reporter, a friend of Peter Parker who may suspect he is really Spider-Man. Ryan Penagos (reporter) - based on actual person, interviewed Tony Stark and David Purdin. J. Michael Straczinski (reporter) - based on actual person, worked for the Marvel Comics universe version of Marvel Comics. Joseph "Robbie" Robertson (Editor-in-Chief) - Presently the Editor-in Chief for Frontline. Lance Bannon (Photographer) - killed by F.A.C.A.D.E. Simon J. Goodman (publisher) - publisher in the 1940s, name is probably a reference to Martin Goodman, first publisher of Marvel Comics. Jeffrey Haight (Photographer) - former boyfriend of Anna Kefkin, made alliance with Dr. Octopus in desperate effort to gain a front page photograph. Sent to prison for assisting in Dr. Octopus' escape. Walter "Old Man" Jameson (Editor/Reporter) - Mistakenly assumed to be JJJ's father, David Jameson. Peter Parker (Photographer, usually freelance): Fired for refusing to accept Dexter Bennett's way of doing business. Presently works as a freelance photographer for the "Frontline". Addie Pinckney (Los Angeles Correspondent) - status unknown, was elderly when depicted. Ben Urich (Reporter) - Resigns after the Civil War and creates Frontline. William "Billy" Walters (Photographer) - Left the Bugle to care for his aging mother. Norah Winters (reporter); fired due to affiliation with Phil Urich after his secret identity was exposed. Phil Urich (cameraman for Norah, current Hobgoblin); fired after secret identity was exposed. Ray Rothman (employee) - fired by J. Jonah Jameson for viewing article. In the Age of Apocalypse timeline, the Daily Bugle is a clandestine paper run by humans meant to inform the public about the secrets of Apocalypse, here the tyrannical ruler of North America. This Daily Bugle is run by a Robbie Robertson, who is killed by a Brood-infected Christopher Summers, leaving the status of the paper unknown. In the Marvel 1602 setting, Jameson is publisher of the first "news-sheet" in the New World; the Daily Trumpet. In this alternate reality, the Daily Bugle exists mostly as a propaganda machine for the ruling mutant hierarchy. Stories can be and are repressed if they aren't favorable enough to mutants. In this reality, a blue-skinned woman named Cerena Taylor is the editor-in-chief. Other staff members include Bugman (the Daily Bugle's paparazzi driver), Jacob Guntherson (the Daily Bugle's photographer), and Triporter (the Daily Bugle's three-eyed reporter). In the Ultimate Marvel universe, the Bugle is much the same as in the 616 version. The main difference is that Peter Parker is not employed as a photographer, but works on the newspaper's website after Jameson sees him assist with a problem. The newspaper plays less of a role in Ultimate Spider-Man than it did in the comics portraying the equivalent period of the 616 Spider-Man's career. Peter frequently implies that he doesn't spend much time there. After the events of Ultimatum, the Daily Bugle, much like the rest of New York, was heavily damaged. Instead of a full rebuild, the Bugle was made into an online newspaper and blog. Another Daily Bugle newspaper appeared in a 1958 unaired pilot episode The Adventures of Superpup. In the 1970s live-action Spider-Man TV series, Peter Parker is seen at the Daily Bugle in every episode. In the X-Men: Evolution episode "On Angel's Wings" Angel is seen reading about his heroic exploits in the Daily Bugle. In the Spider-Man 3 special episode, X-Play parodied the paper in a skit called "The X-Play Bugle" with Adam Sessler as the editor-in-chief. In The Spectacular Spider-Man, The Daily Bugle is a New Yorker newspaper led by an irascible, gruff publisher named J. Jonah Jameson. the Daily Bugle is a frequently visited location by many series characters, including Peter Parker. Like in the films and Marvels comic book series, it is also depicted to be housed in the Flatiron Building. The newspaper is noted for its anti-superhero slant, especially concerning Spider-Man, whom the paper carries out a smear campaign against Spider-Man that has, at least temporarily, turned much of the gullible city against the hero. The Daily Bugle is mentioned during a conversation between Peter Parker and Mary Jane Watson in the Ultimate Spider-Man episode "Great Power". When Mary Jane develops an interest in journalism and wants to become an employee for the Daily Bugle, Peter disapproves of her choice. The Daily Bugle is again mentioned in "Great Responsibility", but briefly. The Daily Bugle is finally seen in the episode "Beetle Mania". In the episode of The New Scooby-Doo Movies episode "Sandy Duncan's Jekyll and Hyde", one of the cut out letters for a ransom note is from a newspaper. The newspaper reads Daily Bu le with the g missing. Also shown on the newspaper is the Bugle's signature bugle. In the Tales from the Crypt episode "What's Cookin'", starring Christopher Reeve, the restaurant critic for the Daily Bugle visits Gaston, Fred & Erma's Steakhouse. The Bugle is seen in most media adaptations of Spider-Man, the most prominent appearance being in the 2002 Spider-Man film and its sequels. In the movies, the Bugle is housed in the Flatiron Building (as it is in the Marvels miniseries by Kurt Busiek and Alex Ross), and Jameson is played by J. K. Simmons. One Bugle employee who appears exclusively in the films is Hoffman, who serves as comic relief and is frequently harassed by Jameson. Hoffman is played by Ted Raimi, who is the brother of Sam Raimi, the director of the Spider-Man film series. In Spider-Man 3, Eddie Brock (played by Topher Grace) is a photographer employed by the Bugle. In the comics, Eddie worked for the rival Daily Globe. Ben Urich appears in Daredevil, but works for the New York Post. In Frank Darabont's Academy Award nominated film, The Shawshank Redemption, Andy Dufresne, played by Tim Robbins sends a package to "the Portland Daily Bugle" containing the information about the Shawshank warden's illegal money laundering operations. Christine Everhart appears in Iron Man and Iron Man 2, but works for Vanity Fair. The Daily Bugle is featured as both a newspaper and TV station in The Amazing Spider-Man . The Bugle is also seen in The Amazing Spider-Man 2. In the arcade and console-imported game Marvel Super Heroes, the Bugle is Spider-Man's home stage. The fighting takes place on a platform that is first going vertical and then across the Daily Bugle. In the multi-platform video game Marvel Nemesis: Rise of the Imperfects, the Daily Bugle is a recurring battleground throughout the story mode and available in the versus mode. Here the rooftop is surrounded by three destructible walls, and covered with explosive barrels, air conditioners, pipes, and poles for use in battle. Even the trademark letters that form "Daily Bugle" are available for throwing at enemies once damaged. In the Ghost Rider video game released in 2007, the Daily Bugle appears in the challenge mode of the game. It even has big spider webs in the corners, which is a reference to Spider-Man. The Daily Bugle is featured in many of the Spider-Man games. The Daily Bugle is seen in the background of Cyclops/Spider-Man's level in the game X-Men: Mutant Academy 2. In the game Spider-Man 2, the Daily Bugle is featured. Daily Bugle is seen in the Incredible Hulk video game. Like other buildings in the game, it can be destroyed. The Daily Bugle is one of the main landmarks of the game Spider- Man 3. The player can shoot from the two heat releasers there across New York. There are seven photo missions that Robbie will give Peter. The first Lizard mission and most of the Mad Bomber missions take place there. In Spider-Man: Web of Shadows, Moon Knight receives a tip that the Kingpin's men might rob or destroy the Daily Bugle, so he sends Spider-Man to investigate. But upon arriving there, it is revealed that it was a false lead. The Daily Bugle is featured as a stage in Marvel vs Capcom 3: Fate of Two Worlds. The Daily Bugle will be featured in Disney Infinity: 2.0 Edition as Daily Bugle Communications (DBC) with J. Jonah Jameson's face on the big monitor. 1 2 The Amazing Spider-Man # 554 - "Burned!" ↑ Sanderson, Peter (2007). The Marvel Comics Guide to New York City. New York City: Pocket Books. pp. 36–39. ISBN 1-4165-3141-6.